Founded in 1932, the Santa Barbara Historical Museum is committed to preserving and sharing local history. Its mission is to be a repository, interpreter and communicator of the rich history of the Santa Barbara region. Through exhibitions, scholarship, educational programs and preservation of the region’s material culture, their goal is to connect people of all backgrounds to historically important ideas, people and objects. The Museum’s extensive holdings include paintings, furniture, saddles, decorative arts, and costumes that represent over 500 years of Chumash, Mexican, Spanish and American history. Visitors to the Museum’s campus may experience history through the signature exhibition, The Story of Santa Barbara, the historic adobes buildings onsite and also through the Gledhill Research Library. The Museum is located in the historic district of downtown at 136 East De la Guerra Street, just two blocks off of State Street. Entrance to the Museum is $7 for adults, $5 for seniors/students and FREE to Members and anyone under 18. The Museum offers tours of the Fernald Mansion, the home of Judge Charles Fernald, one of Santa Barbara history's most well known individuals. 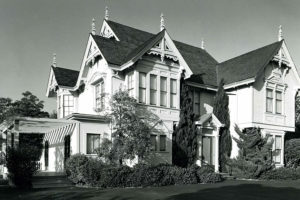 The Victorian style historic house museum is located at 414 East Montecito Street. The home is available for tours by advance reservation on Saturdays at 11:00 am.